This is Part 6 of a Series on the subversion of the Scout Oath and Law. A SCOUT IS COURTEOUS. 5. A Scout is courteous. He is polite to all, especially to women, children, old people, and the weak and helpless. He must not take pay for being helpful or courteous. A Scout is polite to everyone regardless of age or position. He knows that using good manners makes it easier for people to get along. and the weak and helpless. He must not take pay for being helpful or courteous. He knows that using good manners makes it easier for people to get along. This is Part 5 of a Series on the subversion of the Scout Oath and Law. A SCOUT IS FRIENDLY. 4. A Scout is friendly. He is a friend to all and a brother to every other Scout. A Scout is a friend to all. He is a brother to other Scouts. He offers his friendship to people of all races and nations, and respects them even if their customs are different from his own. A Scout is a friend to all A Scout is a friend to all. and a brother to every other Scout. He is a brother to other Scouts. and respects them even if their customs are different from his own. This is Part 4 of a Series on the subversion of the Scout Oath and Law. A SCOUT is HELPFUL. 3. HELPFUL. A SCOUT is HELPFUL. He must be prepared at any time to save life, help injured persons, and share the home duties. He must do at least one good turn to somebody every day. 3. HELPFUL. A Scout is concerned about other people. He does things willingly for others without pay or reward. He must be prepared at any time to save life, A Scout is concerned about other people. and share the home duties. He must do at least one good turn to somebody every day. He does things willingly for others without pay or reward. This is Part 3 of a Series on the subversion of the Scout Oath and Law. A Scout is Loyal. 2. LOYAL. A SCOUT is LOYAL. He is loyal to all to whom loyalty is due; his Scout Leader, his home and parents and country. 2. A Scout is LOYAL. A Scout is true to his family, friends, Scout leaders, school, nation, and world community. This is Part 2 of a Series on the subversion of the Scout Oath and Law. 1. A Scout is Trustworthy. 1. TRUSTWORTHY. A Scout’s honor is to be trusted. If he were to violate his honor by telling a lie or by cheating or by not doing exactly a given task, when trusted on his honor, he may be directed to hand over his Scout Badge. A Scout tells the truth. He keeps his promises. Honesty is part of his code of conduct. People can depend on him. or by not doing exactly a given task, He keeps his promises. he may be directed to hand over his Scout Badge. Honesty is part of his code of conduct. People can depend on him. The Boy Scouts of America was wrecked by the dedicated efforts of socialists and the so-called Red Diaper baby communists, working over many decades. 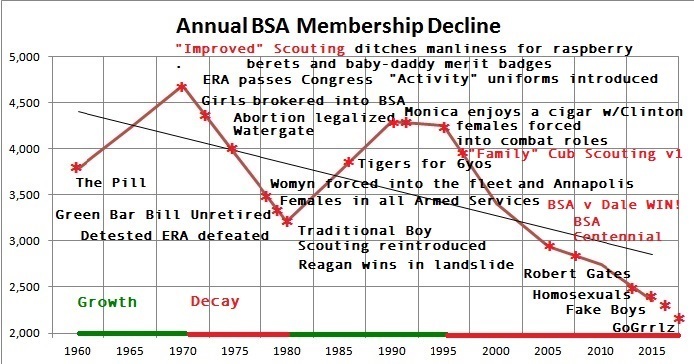 The 1972 subversive disaster entitled “The Improved Scouting Program” inflicted considerable damage but, thanks to Green Bar Bill‘s heroic efforts, a much diminished Boy Scouts lingered on. Communists are nothing if not persistent. The wounded but not killed boy scouts was a humiliating reminder of their failure. “Family Scouting” is a second go at Improved Scouting, a coup de grace without Green Bar Bill to ride to boy scouting’s rescue. What happened? How did a fundamentally Christian, traditionalist, conservative movement with an incorporating charter from the U.S. Congress itself, fall to a mere handful of agitators and infiltrators? We will study the strategy and tactics used against the Boy Scouts and all other important American institutions as advised by Sun Tzu. Armed with understanding, we can retake Boy Scouting and all American civilization.